Whilst foraging along the towpath I was given this piece off a “puffball” mushroom. 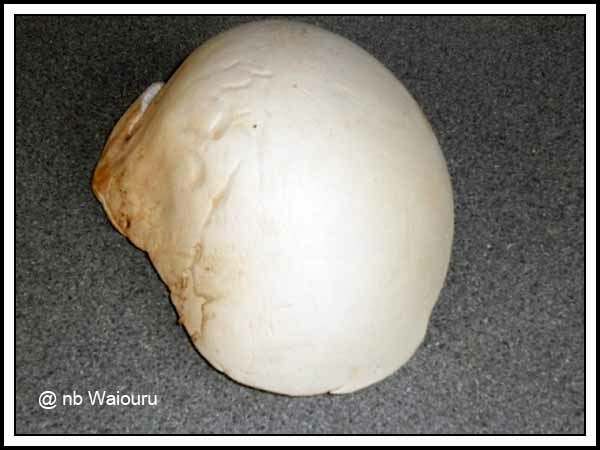 The puffball mushroom was the size of a human skull and when first shown it I though that’s what it was. I was kindly given a fifth of the mushroom to bring back to the boat. One entry in Wikipedia states none of the puffballs are edible whilst another states they are. Jan cooked a small portion at lunch and fed it to me. She closely observed me all afternoon and as I was still walking by dinner she cooked the remainder; which we ate it with potato's, carrots and peas. Very tasty it was too! Another thing to look for when out walking. Puffballs are marvellous we where given one near Skipton and it fed 5 of us cooked in butter with a couple of bottles of wine. Up there we used to eat a lot of wild fungi but sine the Horse Whisperer has had kidney failure from eating the wrong fungi we are not as keen. Having said that when cycling in Italy we had some marvellous fungi meals but over there you can go into the Chemist to verify that what you have picked is edible. Hugh Fernley-Whittingstall did a lovely recipe for a stuffed puff ball. Look up river cottage recipes. Why do females find me attractive? Water Storage Issue Fixed….. I hope! Why do problems come in three’s?